Welcome to Jayce's Vintage Radios. I offer services of repairing and restoring antique and vintage radios made in the 1920s to the 1960s. 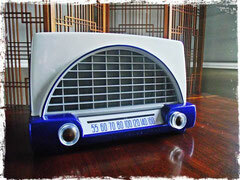 My site and Youtube channel, JaycesVintageRadios showcase some of the radios I've restored. Contact me if you'd like to have your radio restored, or if you're looking for any particular radio parts.